We are a leading Manufacturer of brewery tanks and brewery plant from Rajahmundry, India. SSEC represents over 30 years of combined experience in beer, spirit, cider and general beverage production throughout the world, from the USA to Asia. Our vertical integration allows us to offer our clients a one-stop shop and our mobility allows us to tailor a solution that is specific to your situation. Based in India and with an Asia Pacific focus, we come armed with academic training and first-hand experience in establishing these facilities from the ground up. We focus on providing considered, independent and high-quality consulting services that adhere to our motto 'Invest Once, Invest Right'. Successful breweries, distilleries and beverage production facilities are built on specialized knowledge, experience, and vision. We bring this energy to every project and also bring up-to-date information on emerging trends and technologies within the beverage industries. At SSEC, we offer many individuals and packaged consulting services for the beverage industry. Essentially we tailor our consulting services to your specific requirements so you receive the most relevant support for your project. We act as specialist brokers to find the best equipment for your needs. We compare different systems on offer, and with access to every manufacturer in the world, we can often attract more competitive pricing due to our previous dealing with these suppliers. We are regularly contacted by international manufacturers wishing to move good quality second-hand pieces. As a result, we have access to a plethora of second-hand options, especially within the micro brewing industry. Over the last 10 years, we here at SSEC have been dedicated to assisting people to establish and develop Commercial / Industrial Breweries, Microbreweries, Pub Breweries, Cideries, Distilleries and General Beverage Production Facilities across Asia Pacific, Africa. 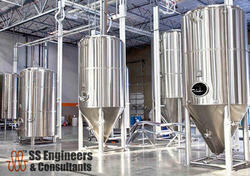 Whether you require specific consulting services such as Facility Design, Process Development, Equipment Design, Specification and Installation, Recipe Development, or our flagship complete Turnkey Solutions Service, we come well-armed with academic knowledge and practical experience, especially in the Brewery, microbrewery and distillation fields to assist you.